The item (Don't mess with) Clear Lake women, (electronic resource) represents a specific, individual, material embodiment of a distinct intellectual or artistic creation found in Richland Library. 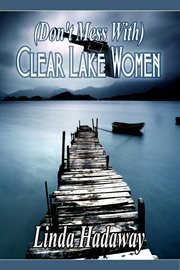 (Don't Mess With) Clear Lake Women.....is a novel about four women. Their bond of family and friendship is tightly woven. They don't take friendship flippantly, or loyalty; neither do they take betrayal lightly, or harm to a loved one. It's about their hopes, and dreams, the relationships they are involved in, and ... hidden secrets of the past. Madison Manning- independent. She struggles with her Obsessive-Compulsive Disorder and insecurities about a long lasting relationship. She is the anchor for her friends. Roxy Hunter- strives to be her own woman. Dealing with a self-absorbed mother and an abusive uncle who is dying, Roxy is thankful for her close friends. Love? She is sure it won't happen to her. Jacki Blake- self-reliant; runs her own landscaping business. The only gay woman in the group. She too, would like to find true love, however fears commitment. Sunday Nelson - married to an abusive husband, Duffy. The abuse is growing more severe. Within the story, she carefully begins to form a plan to leave him. Can she do it- and live?